Sergei Shakhrai, one of the authors of Russia’s constitution, explained to RBTH what really brought about the USSR’s demise, and what prevented Russia from splitting apart further. During the turbulent years of the Soviet collapse, parliamentarian Sergei Shakhrai supported the Declaration of Sovereignty, passed by parliamentary deputies on June 12, 1990 – which would later be interpreted by some as Russia’s declaration of “independence” from the Soviet Union. Now called “Russia Day”, June 12 is celebrated as Russia’s national holiday, and Shakhrai went on to co-author Russia’s new Constitution three years later. On the eve of the 23rd anniversary of the Declaration of Sovereignty, RBTH spoke to Shakhrai about what brought about the demise of the world’s largest country. 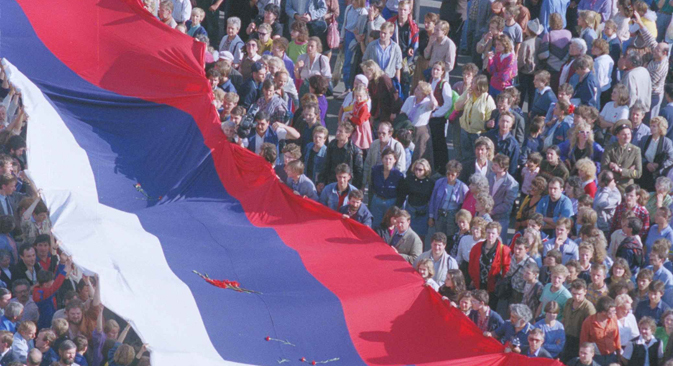 Russia Beyond The Headlines: What events led up to Russia’s Declaration of Sovereignty on June 12, 1990? Sergei Shakhrai: The Soviet leadership at the time could see that Article 73 of the Soviet Constitution, which guaranteed the right to secede from the Union to any federal subject and had been dormant for decades, suddenly began to look attractive to various union republics amid weakness in Moscow. This was followed up by events in the Baltic States, Ukraine and other Soviet territories. The article was a time bomb ready to go off. [Soviet President Mikhail] Gorbachev’s response was to reorganize the USSR’s federal system, a secret plan we learned about after minutes from Politburo meetings were declassified in 1992. The Soviet Union consisted of 15 union republics and another 20 ethnically-based autonomous regions, which were located within those republics and subject to their jurisdiction. The plan called for raising the status of those autonomous regions to that of union republics – in exchange for their support for removing Article 73 from the Constitution. If it had been adopted, we would have had a Soviet Union consisting of 35 republics instead of 15, with none of them legally being able to secede from the country. There was some sense behind this plan, but 16 of those autonomous regions were located on the territory of the modern Russian Federation. They made up 51 percent of its territory and contained a large amount of natural resources within their borders. Without them Russia’s territory would resemble a piece of Swiss cheese with half its territory missing (not to mention 20 million people). So the declaration was a reaction by Russia’s parliament to the Soviet government’s initiative to split half of their territory away. RBTH: What was the atmosphere like during the passage of the declaration? Did you fear accusations of treason? S.Sh. : Treason against whom? The deputies were driven by patriotism. Their logic was: By saving Russia, we are saving the Soviet Union. Because without the Russian Soviet Federated Socialist Republic, there is no USSR. Russia can be bigger or smaller, disintegration and reintegration can occur, but its central role to the entire region is critical. An interesting point here is that following the removal of a quota that required two-thirds of the parliament to be members of the Communist Party of the Soviet Union, the number of elected Communist Party officials within the Russian parliament had actually increased. So the people adopting this declaration were not a bunch of anti-Soviet radicals; they were loyal to the national government, yet they passed the declaration almost unanimously. There’s not a word in the document about independence. On the contrary, it specifically states that that Russia is a part of the Soviet Union. Following the declaration and despite personal animosity toward Soviet leader Mikhail Gorbachev, Boris Yeltsin, as President of Russia, [later] signed the Union treaty on August 18, 1991. Beyond that – the declaration concerned questions of delineating authority between the national government and the [Russian] government. Specifically, it said Russia’s territorial integrity could not be challenged without participation of its own legislative body. So the hype about this being some sort of a declaration of independence is a complete myth. It was neither the start, nor the end of achieving Russian sovereignty. I still can’t understand why it’s now called “Russia Day”. Most people haven’t read the declaration and even fewer understand what it meant, according to the latest polls. Why independence? From whom? It would make more sense to celebrate Russian statehood on December 12, the day our constitution was adopted. RBTH: What effect did the Declaration of Sovereignty have on the future? This was his way of fighting independence movements within Russia amid the absence of effective economic or military options. During the signing of the Union treaty in August 1991, Russia’s autonomous regions signed underneath Boris Yeltsin’s signature – this had been an important point. They acknowledged themselves as part of Russia, and in exchange attained federal status during the negotiations over Russian federalism in March 1992. S.Sh. : I’m shocked that one fact is practically overlooked by historians: Why was a communist party created within the Russian Soviet Federated Socialist Republic? All of the Soviet republics had had their own communist parties, except Russia, because the RSFSR and the Soviet Union were inseparable (Lenin and Stalin had enforced this). So when Ivan Poloskov and Gennady Zyuganov fought politically against Gorbachev by leaving the communist party and creating their own within the RSFSR, a huge division formed within the country. This was compounded after the August 1991 coup when Gorbachev, angry at the coup plotters, announced he was leaving the Communist Party and called on all honest communists to do likewise. But they had nowhere to go. The party’s role as the “leading and guiding force of Soviet society” was enshrined in Article 6 of the Constitution (there were debates going on about abolishing this). But at the time a weakening of the Communist Party meant a weakening of the country. That’s why – if you look at massive demonstrations going on across the Soviet Union in its waning years – they feature people holding seemingly counter-intuitive signs saying, “All Power to the Soviets!” (“Soviet” in Russian means ruling committee, representing the people in this case – RBTH). What they meant was power to the people, and away from the Communist Party. RBTH: What were the viable alternatives? S.Sh. : If the party had been able to reform itself, we would have had, more or less, the Chinese model of development. What do I mean by reform? There was a democratic faction within the Communist Party. It could have broken up into factions, had discussions and reconsolidated. This is something large party organizations should be prepared for and not be afraid of. But having lost the battle for power within the party, Gorbachev took it to the level of government formation. Had we not had Russia’s Declaration of Sovereignty, the disintegration of the Russian Soviet Federated Socialist Republic would have continued and we would have had a Balkans scenario. First the Soviet republics would have left the Union, then the autonomous regions. So the declaration helped win time and prevent the autonomous regions from leaving Russia. It demonstrated that questions of authority and property could be solved within the system. RBTH: Could something similar happen in Russia today? S.Sh. : The disintegration process continued until March 31, 1992, when the Federation Agreement was reached. Then there was complete lack of leadership and chaos until December 1993, when the new Russian Constitution was adopted. Between those dates you had the passage of all the constitutions of Russia’s autonomous regions – this is when disintegration could have really happened. I had the honor of chairing the Chamber of Regions during the Constitutional Convention (it was one of the five chambers). There were a lot of conflicts then; representatives from various regions walked out. Mine and Sergei Alexeyev’s (the Russian constitution’s co-author – RBTH) concept did not foresee a clause for secession from the Russian Federation. We had learned the hard way from the Soviet Union that this was a bad idea. Our model had no concept of sovereign states within Russia. And we ruled out using nationalities as a basis for forming federal subjects – history has shown us that all federations created along national lines fail. The most modern examples include Czechoslovakia, Yugoslavia and the USSR. The autonomous regions were upset by this. To my own credit and that of my colleagues, the final text of the Constitution didn’t have any of those principles. RBTH: But what about Russian regions such as Chechnya and Tatarstan, where a large number of people of a single ethnicity are concentrated? S.Sh. : They are just names. These are also federal subjects under the same national laws as other regions. Our constitution allows for merging them – as you know, during the last decade Russia has gone from having 89 regions to 83 – and expanding the country’s borders.